It was a winning day for Barbi and her 3 boys at the 2017 California Dressage Championships. Wining Day For Sea Horse Ranch! 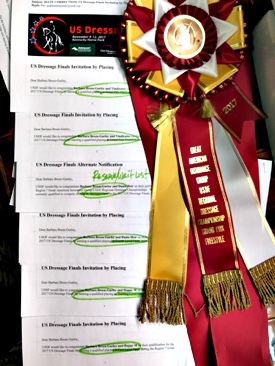 Sea Horse Ranch had a great day at the recent Dressage Championships! Barbi and her 3 boys rode to victory over the weekend long event. Receiving 6 invitations to the national finals in Kentucky in Nov. (two for each horse for the two levels they each competed there). An amazing honor!